A leaked document surfaced on the Web detailing Samsung's Android Marshmallow Update plans. 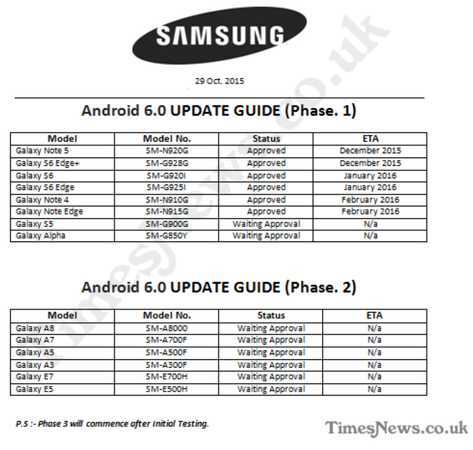 According to the said document, Samsung will be prioritising it's latest flagship Galaxy Note5 and 6S Edge+ first, as the updates for these devices are supposed to start rolling out next month while the Galaxy S6, S6 Edge+ and Note4 will receive their updates in January. The Galaxy Note Edge will be updated to Android Marshmallow in February. Other Samsung devices such as the Galaxy S5 and the Galaxy Alpha are also scheduled to receive updates to Android Marshmallow although a date is yet to be determined. Besides the flagship Galaxy devices, Samsung will also be updating the Galaxy A series and E series devices to Android Marshmallow in the spring of 2016.